Last Friday, we had no "Parting Shot" post; and this week has passed with an enormous amount on our collective plate, but this Friday cannot go un-posted. And for good reason. Its taken a week or so to regain our bearings following an event a couple of the partners here attended last Friday -- a "day of story telling" as it was characterized. But to ignore the fact that underlying it was an afternoon of respectful observance would be to deny that how ever you positioned the event, it was at base a memorial. Indeed, last Friday some of us attended a gathering of what felt like close to a 1,000 friends, colleagues, students, and admirers of the late Geoff Hollister. The event was held on the Nike World Headquarters campus in the Tiger Woods Conference Center's Stanford Auditorium. As many of our readers know, there is considerable Nike marketing DNA in our make-up; several of us have worked for Uncle Swoosh in years gone by, we continue to provide our services and expertise when called upon, and one of our partners even hails as a former Oregon Duck, albeit struggling from behind a cadre of some of the best track runners in history, and who has faithfully been a Nike loyalist and one time Nike athlete for 3 decades. So roots run deep. Deep enough that Goeff Hollister, for whom this event was in honor of, provided our partner with his first pair of Nike spikes, and it changed the course of his life. That last sentence is worth repeating. Because you see, without Geoff Hollister's tireless advocacy and evangelism on behalf of Nike, the ~$19B global atheltic footwear, apparel, equipment, and related digital services giant might not be any of that today. In our minds, and our parting shot for today, Geoff Hollister was arguably the father of customer relationship management. And our partner who was mentored by Geoff is but one micro-example of his work. Hollister became a staunch advocate for the athlete on behalf of the brand, building loyalty every step of the way for every athlete who wanted to be better and achieve their potential. Geoff Hollister, together with his life-long colleague and friend, Nelson Farris, exhibited the kind of brand management stump work that CRM should stand for. His untimely departure after a decade battle with cancer has truly impacted us all at C[IQ], perhaps no one as much as our partner, Gregory. But it has refueled us as well. Indeed, there is no finish line to our work. But today, as our weekly "Parting Shot" we wanted to simply remember one man's tireless work for nearly 42 years -- in fact, working nearly to the day of his passing in February -- on behalf of the ideals, the principles, the maxims, and the promise of the Nike brand. He will be missed, but his passion and example of the very basics of CRM will never be forgotten here. Nike probably had not heard of the term "CRM" 32 years ago (assuming the term had been coined yet), but there is little doubt, they were engaged in what would become the most important CRM initiative in corporate history. We're only humbled to have helped continue that initiative some 25 years later, with our Managing Partner having led a 5-year effort from 2003-2008 to build their global consumer marketing database and related direct and digital marketing tools to continue in the digital age, the work begun by Geoff Hollister in the waning years of the industrial age. So, we close today with a reprint of the text of the clever Ad that Nike thought to produce circa 1980. These are not the kind of people you want hanging around the office. And we've done our best to keep then brushing their teeth in airport washrooms. For one simple reason. In their own bizarre way, they have the ability to work with athletes. Take Nelson Farris, on the right. One minute, he's leading three world class runners through the Ramada Inn in Fresno, singing breakfast cereal commercials at the top of their lungs. The next, he's getting feedback on a prototype racing flat. So it can be right when it hits the market. From day one, he's been on the road. Holding clinics anywhere there was a high school. Attending meets so small even parents wouldn't show. And if there's a race for women in this country, odds are Pam Magee will be there. From the outset, she wanted women to have more races, longer races, the same chance to travel and compete as men. So she set up the first promotional program in the business to see that they did. Geoff Hollister is the same kind of raving idealist. 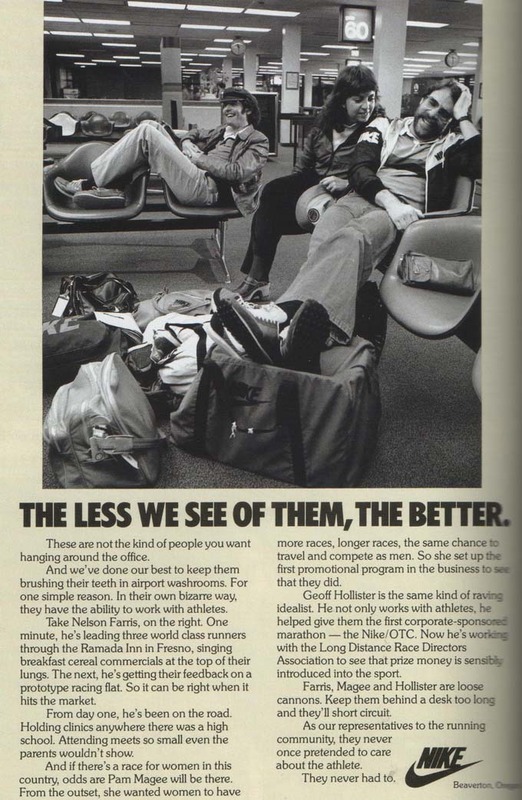 He not only works with athletes, he helped give them the first corporate-sponsored marathon -- the Nike/OTC. Now he's working with the Long Distance Race Directors Association to see that prize money is sensibly introduced into the sport. Farris, Magee, and Hollister are loose cannons. Keep them behind a desk too long and they'll short circuit. As our representatives to the running community, they never once pretended to care about the athlete. Need we say any more on this Friday? Greg has been in the tech sector as a software architect and engineer, product manager, marketing and biz dev exec., and even IP and privacy lawyer for 3 decades. He is currently on the Board of a non-profit tech foundation reinventing America's election technology, is a venture adviser in the Silicon Valley, and serves as the CTO for C[IQ] Strategies, Inc.
We catalyze customer retention. Our solutions help your customers become more engaged, more loyal, and more profitable.